Dr.Malpani's Blog: Have IVF doctors become too commercial ? One of the commonest complaints patients have about IVF doctors is that they’ve become very commercial. They feel doctors no longer provide any personalised care, and that they are really not interested in the patient , or the emotional trauma which they are going through. 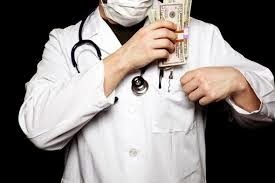 They feel that doctors just look at patients as sources of revenue , and all they want to do is do procedures and tests and treatments in order to extract money from them. I think this is sad because it obviously creates a rift between patient and doctor . It's important that the patient be able to trust that her doctor is doing what is in her best interests, otherwise it becomes very hard to move forward. Today, patients take a very jaundiced view of the medical profession as a whole. It’s partly doctors who are to blame for this , because we don’t spend enough time in educating patients about what their problems are , and what the possible treatment solutions are. This is one of the reasons why patients have very unrealistic expectations of their doctors. IVF doctors will often over promise success, and this creates a lot of unhappiness when the cycle fails, as most cycles are doomed to do. Even worse, when the HCG is negative, they abandon the patient , and are not available when she needs them the most, because they don't want to deal with upset patients - they'd rather be trying to attract new IVF patients. Patients need to understand that just because a doctor charges for his treatment , this doesn’t mean that he is commercial and uncaring. After all, a doctor does need to earn money and, unless he makes a profit, he’s not going to be able to run a clinic or treat his patients. However, it’s important that there be transparency and openness , so that patients know exactly how much they need to pay. Equally importantly, doctors need to understand that their infertile patients are much more than just people with blocked tubes or low sperm counts. It’s not enough to just provide IVF technology. They need to deal with them with compassion and empathy. Just high quality care is not enough - they need to be caring as well ! A good doctor is interested in a patient as a person , and not just as a patient who needs to be treated. Not only is this good for the patient, it’s actually very good for the doctor, otherwise providing IVF treatment can get very monotonous and repetitive. Every patient is different , because every patient has their own unique story to tell, and this is what makes IVF so interesting and exciting. As IVF doctors, we need to start looking beyond the ultrasound images or the lab reports the patients bring with them, and start looking inside their heart and brain . This will help us to respect our patients , and enjoy what we do. Helping patients to get pregnant with IVF is a great opportunity to do good, and we should make the most of it, for our own sake, and the sake of our patients as well. Looking for a doctor who puts patients first ? Please send me your medical details by filling in the form at www.drmalpani.com/free-second-opinion so that I can guide you better !